Saint Margaret of Scotland (Scots: Saunt Magret, c. 1045 – 16 November 1093), also known as Margaret of Wessex, was an English princess and a Scottish queen. Margaret was sometimes called "The Pearl of Scotland". Born in exile in the Kingdom of Hungary, she was the sister of Edgar Ætheling, the shortly reigned and uncrowned Anglo-Saxon King of England. Margaret and her family returned to the Kingdom of England in 1057, but fled to the Kingdom of Scotland following the Norman conquest of England in 1066. By the end of 1070, Margaret had married King Malcolm III of Scotland, becoming Queen of Scots. She was a very pious Roman Catholic, and among many charitable works she established a ferry across the Firth of Forth in Scotland for pilgrims travelling to St Andrews in Fife, which gave the towns of South Queensferry and North Queensferry their names. 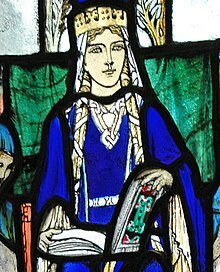 Margaret was the mother of three kings of Scotland, or four, if Edmund of Scotland (who ruled with his uncle, Donald III) is counted, and of a queen consort of England. According to the Vita S. Margaritae (Scotorum) Reginae (Life of St. Margaret, Queen (of the Scots)), attributed to Turgot of Durham, she died at Edinburgh Castle in Edinburgh, Scotland in 1093, merely days after receiving the news of her husband's death in battle. In 1250, Pope Innocent IV canonized her, and her remains were reinterred in a shrine in Dunfermline Abbey in Fife, Scotland. Her relics were dispersed after the Scottish Reformation and subsequently lost. Mary, Queen of Scots, at one time owned her head, which was subsequently preserved by Jesuits in the Scottish College, Douai, France, from where it was subsequently lost during the French Revolution. Margaret from a medieval family tree. Margaret was the daughter of the English prince Edward the Exile, and granddaughter of Edmund Ironside, King of England. After the Danish conquest of England in 1016, King Canute the Great had the infant Edward exiled to the continent. He was taken first to the court of the Swedish king, Olof Skötkonung, and then to Kiev. As an adult, he travelled to Hungary, where in 1046 he supported the successful bid of King Andrew I for the Hungarian crown. King Andrew I was then also known as "Andrew the Catholic" for his extreme aversion to pagans and great loyalty to the Roman Catholic Church. The provenance of Margaret's mother, Agatha, is disputed, but Margaret was born in Hungary c. 1045. Her brother Edgar the Ætheling and sister Cristina were also born in Hungary around this time. Margaret grew up in a very religious environment in the Hungarian court. Still a child, she came to England with the rest of her family when her father, Edward the Exile, was recalled in 1057 as a possible successor to her great-uncle, the childless King Edward the Confessor. Whether from natural or sinister causes, her father died immediately after landing, and Margaret continued to reside at the English court where her brother, Edgar Ætheling, was considered a possible successor to the English throne. When Edward the Confessor died in January 1066, Harold Godwinson was selected as king, possibly because Edgar was considered too young. After Harold's defeat at the Battle of Hastings later that year, Edgar was proclaimed King of England, but when the Normans advanced on London, the Witenagemot presented Edgar to William the Conqueror, who took him to Normandy before returning him to England in 1068, when Edgar, Margaret, Cristina, and their mother Agatha fled north to Northumbria, England. According to tradition, the widowed Agatha decided to leave Northumbria, England with her children and return to the continent. However, a storm drove their ship north to the Kingdom of Scotland in 1068, where they sought the protection of King Malcolm III. The locus where it is believed that they landed is known today as St Margaret's Hope, near the village of North Queensferry, Fife, Scotland. Margaret's arrival in Scotland, after the failed revolt of the Northumbrian earls, has been heavily romanticized, though Symeon of Durham implied that her first meeting of Malcolm III may not have been until 1070, after William the Conqueror's Harrying of the North. King David I alongside his designated successor, Máel Coluim mac Eanric. Margaret's biographer Turgot of Durham, Bishop of St. Andrew's, credits her with having a civilizing influence on her husband Malcolm by reading him narratives from the Bible. She instigated religious reform, striving to conform the worship and practices of the Church in Scotland to those of Rome. This she did on the inspiration and with the guidance of Lanfranc, a future Archbishop of Canterbury. She also worked to conform the practices of the Scottish Church to those of the continental Church, which she experienced in her childhood. Due to these achievements, she was considered an exemplar of the "just ruler", and moreover influenced her husband and children, especially her youngest son, the future King David I of Scotland, to be just and holy rulers. "The chroniclers all agree in depicting Queen Margaret as a strong, pure, noble character, who had very great influence over her husband, and through him over Scottish history, especially in its ecclesiastical aspects. Her religion, which was genuine and intense, was of the newest Roman style; and to her are attributed a number of reforms by which the Church [in] Scotland was considerably modified from the insular and primitive type which down to her time it had exhibited. Among those expressly mentioned are a change in the manner of observing Lent, which thenceforward began as elsewhere on Ash Wednesday and not as previously on the following Monday, and the abolition of the old practice of observing Saturday (Sabbath), not Sunday, as the day of rest from labour (see Skene's Celtic Scotland, book ii chap. 8)." The later editions of the Encyclopædia Britannica, however, as an example, the Eleventh Edition, remove Skene's opinion that Scottish Catholics formerly rested from work on Saturday, something for which there is no historical evidence. Skene's Celtic Scotland, vol. ii, chap. 8, pp. 348–350, quotes from a contemporary document regarding Margaret's life, but his source says nothing at all of Saturday Sabbath observance, but rather says St. Margaret exhorted the Scots to cease their tendency "to neglect the due observance of the Lord's day." She attended to charitable works, serving orphans and the poor every day before she ate and washing the feet of the poor in imitation of Christ. She rose at midnight every night to attend the liturgy. She successfully invited the Benedictine Order to establish a monastery in Dunfermline, Fife in 1072, and established ferries at Queensferry and North Berwick to assist pilgrims journeying from south of the Firth of Forth to St. Andrew's in Fife. She used a cave on the banks of the Tower Burn in Dunfermline as a place of devotion and prayer. St. Margaret's Cave, now covered beneath a municipal car park, is open to the public. Among other deeds, Margaret also instigated the restoration of Iona Abbey in Scotland. She is also known to have interceded for the release of fellow English exiles who had been forced into serfdom by the Norman conquest of England. Malcolm was apparently largely ignorant of the long-term effects of Margaret's endeavours, not being especially religious himself. He was content for her to pursue her reforms as she desired, which was a testament to the strength of and affection in their marriage. Her husband Malcolm III, and their eldest son Edward, were killed in the Battle of Alnwick against the English on 13 November 1093. Her son Edgar was left with the task of informing his mother of their deaths. Not yet 50 years old, Margaret died on 16 November 1093, three days after the deaths of her husband and eldest son. The cause of death was reportedly grief. She was buried before the high altar in Dunfermline Abbey in Fife, Scotland. In 1250, the year of her canonization, her body and that of her husband were exhumed and placed in a new shrine in the Abbey. In 1560, Mary Queen of Scots had Margaret's head removed to Edinburgh Castle as a relic to assist her in childbirth. In 1597, Margaret's head ended up with the Jesuits at the Scottish College, Douai, France, but was lost during the French Revolution. King Philip of Spain had the other remains of Margaret and Malcolm III transferred to the Escorial palace in Madrid, Spain, but their present location has not been discovered. Several churches throughout the world are dedicated in honour of St Margaret. One of the oldest is St Margaret's Chapel in Edinburgh Castle in Edinburgh, Scotland, which her son King David I founded. The Chapel was long thought to have been the oratory of Margaret herself, but is now thought to have been established in the 12th century. The oldest edifice in Edinburgh, it was restored in the 19th century and refurbished in the 1990s. Numerous other institutions are named for her as well. The Heraldry of Queensferry, which provides the best information and images, interspliced throughout the page, on St. Margaret's arms and their variations. ^ H.E Marshall (1906). "Malcolm Canmore – Saint Margaret came to Scotland". Scotland's Story. Retrieved 18 March 2011. ^ Menzies, Lucy (2007). St. Margaret Queen of Scotland (reprint ed.). Edinburgh: The St. Margaret's Chapel Guild. pp. 16–23. ^ Encyclopædia Britannica, Ninth Edition, Volume XV, page 537. ^ "St Margaret's Cave". VisitScotland. Retrieved 18 March 2011. ^ a b Ashley, Mike (1999). The mammoth book of British kings and queens. London: Robinson Publishers. p. 399. ISBN 1-84119-096-9. ^ Farmer, David Hugh (1997). The Oxford dictionary of saints (4th ed.). Oxford [u.a. ]: Oxford Univ. Press. ISBN 9780192800589. This article incorporates text from a publication now in the public domain: Chisholm, Hugh, ed. (1911). "Margaret, St, Queen of Scotland" . Encyclopædia Britannica. 17 (11th ed.). Cambridge University Press. p. 701. Anderson, Alan Orr (tr.). Early Sources of Scottish History: AD 500–1286. Vol. 1. Edinburgh, 1923. Reprinted in 1990 (with corrections). Turgot of Durham, Vita S. Margaritae (Scotorum) Reginae. Ed. and trans. Catherine Keene, in Saint Margaret, Queen of the Scots: A Life in Perspective, New York, 2013, Appendix: Translation of the Dunfermline Vita, pp. 135-221. Ed. J. Hodgson Hinde, Symeonis Dunelmensis opera et collectanea. Surtees Society 51. 1868. 234-54 (Appendix III). tr. William Forbes-Leith, SJ, Life of St. Margaret, Queen of Scotland by Turgot, Bishop of St Andrews. Edinburgh, 1884. PDF available from the Internet Archive. Third Edition. 1896. Trans. anon., The Life and Times of Saint Margaret, Queen and Patroness of Scotland. London, 1890. PDF available from the Internet Archive. William of Malmesbury, Gesta regum Anglorum. Ed. and trans. R. A. B. Mynors, R. M. Thomson, and M. Winterbottom, William of Malmesbury. Gesta Regum Anglorum. The History of the English Kings. OMT. Vol 1. Oxford, 1998. Ed. and trans. Marjorie Chibnall, The Ecclesiastical History of Orderic Vitalis. 6 vols. OMT. Oxford, 1968-80. John of Worcester, Chronicle (of Chronicles). Ed. B. Thorpe, Florentii Wigorniensis monachi chronicon ex chronicis. 2 vols. London, 1848-9. Trans. J. Stevenson, Church Historians of England. Vol. 2.1. London, 1855. P. 171–372. Acta Sanctorum Vol. 2, June, 320. London, 1515. 225. Baker, D. "A Nursery of Saints: St Margaret of Scotland Reconsidered." In Medieval Women, ed. D. Baker. SCH. Subsidia 1. 1978. Bellesheim, Alphons. History of the Catholic Church in Scotland. Vol 3, trans. Blair. Edinburgh, 1890. pp. 241–63. Butler, Alban. Lives of the Saints. 10 June. Challoner, Richard. Britannia Sancta, I. London, 1745. P. 358. Dunlop, Eileen, Queen Margaret of Scotland, 2005, NMS Enterprises Limited – Publishing, Edinburgh, 978 1 901663 92 1. Huneycutt, L.L. "The Idea of a Perfect Princess: the Life of St Margaret in the Reign of Matilda II (1100–1118)." Anglo-Norman Studies, 12 (1989): pp. 81–97. Keene, Catherine. Saint Margaret, Queen of the Scots: A Life in Perspective. New York: Palgrave Macmillan, 2013. Madan. The Evangelistarium of St. Margaret in Academy. 1887. Parsons, John Carmi. Medieval Mothering. 1996. Olsen, Ted. Kristendommen og Kelterne Forlaget. Oslo: Forlaget Luther, 2008. (P. 170). ISBN 978-82-531-4564-8. Norwegian. Skene, W.F. Celtic Scotland. Edinburgh. Stanton, Richard. Menology of England and Wales. London, 1887. P. 544. Wilson, A.J. St Margaret, Queen of Scotland. 1993. Wikimedia Commons has media related to Margaret of Wessex, Queen of Scotland. Medieval Women: The Life Of St Margaret, Queen Of Scotland By Turgot, Bishop Of St Andrews Ed. William Forbes-Leith, S.J. Third Edition. Edinburgh: David Douglas, 1896 . Retrieved 14 March 2011.